Stuff Points: Earn 12 points when you buy this stuff. Incredible performance and versatility make this tool widely popular. 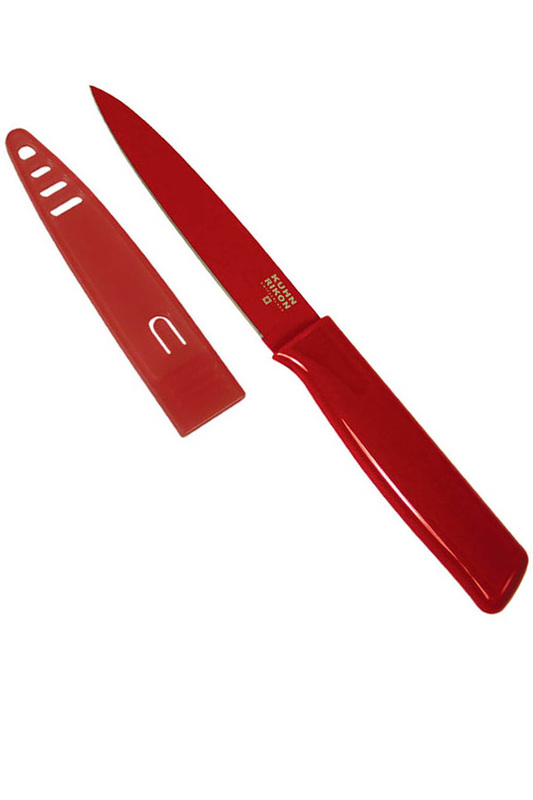 It's larger than a regular paring knife, but shorter and skinnier than a chef's knife. The overall length of the blade measures five inches, and it's forged from a superior quality, Japanese steel. A colorful coating is added to the steel in order to reduce friction, and make it easy to clean. Because it doesn't stick or snag when you slice your food, the razor sharp blade is enhanced to make it even more powerful. Great for de-boning meats, cutting celery, or chopping carrots, this tool provides added length that can improve ability and results for certain tasks. It comes complete with a protective sheath that covers the blade for storage or travel, and it's available in your choice of colors. A matching handle is coated with a soft material that adds comfort, and when combined with the ergonomic shape, it allows for prolonged use without strain. Dishwasher safe, but hand washing is recommended. Looking for something a bit more compact? Try the Colori Paring Knife. It's almost identical, but it has a four inch blade length. Like your knives with serrated edges? We also carry a four inch tool with that type of blade, so check out the Serrated Paring Knife if you like that type better. Japanese Steel. Stronger, sharper and more durable, the higher quality material results in a tool that functions better. Non-Stick. In order to reduce sticking and make cutting effortless, the entire blade is covered with a non-stick coating. Long Lasting. Superior steel combined with a plastic cover ensure proper performance for many years to come. Because it will never be exposed when not in use, the blade will resist damage. On The Go. Safe to take with you, the sheath conceals the blade to make it possible to pack for picnics, camping or a party. Good Looking. The added coating makes it work well, but it also makes it attractive in the process. Why settle for an ugly tool when you could have this one? Stop wasting your effort with inferior tools. This affordable knife can make a huge difference in your kitchen, and it will quickly become your favorite choice for mincing, dicing, peeling, paring and more. Use it on fruits and veggies, or use it for more difficult stuff like raw meat and squishy cheese. The long, slender blade will give you the leverage, angle and reach necessary, and the colorful coating will prevent hesitation and sticking as you slice. Because it comes with a storage sheath as part of the standard package, it will always be protected when you're not using it. 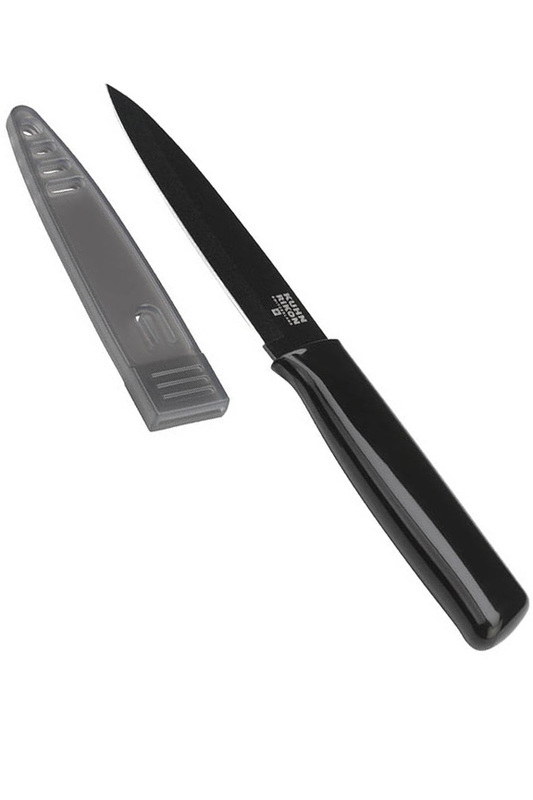 This prevents accidents, but it also keeps the blade sharp and undamaged without any special steps on your part. Use everyday at home, or quickly toss in a bag to take it with you on the go. It's the perfect multi-use cutting tool for casual cooks and professionals alike. Overall Dimensions 9" x 1.2"
Bade Dimensions 5" x 1.2"
Longer than a paring knife, this tool provides added performance for tricky kitchen tasks. Japanese steel is coated to make slicing and washing easy. Quickly Cook Up To 12 Strips. A Healthier & Less Messy Way To Make Breakfast. 12 Inches. A Spoon And Spatula In One! Complete With Stainless Steel Handle.